I have appreciated those that received mailings from the Christmas card dump I ran showing off what they received via blog posts. One of those that took part was Brian from Play at the Plate. I forgotten what I had packed in the numerous team bags, but he posted a card and made mention how it was miscut. I commented that while it was, it just wasn't miscut enough to keep. 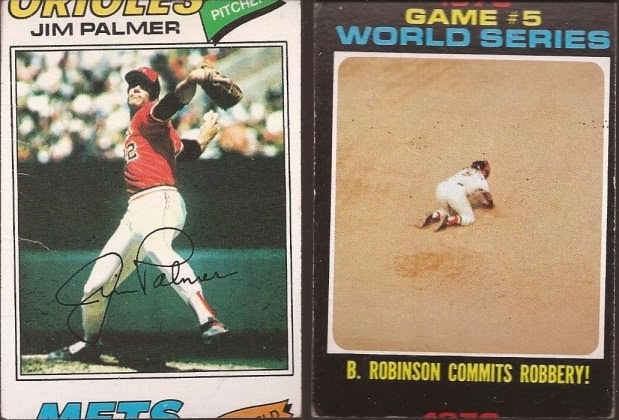 Luckily for me, P-Town Tom from Waiting 'Til Next Year noticed the comment and dropped me a two card PWE, asking if one would make it into my binder. 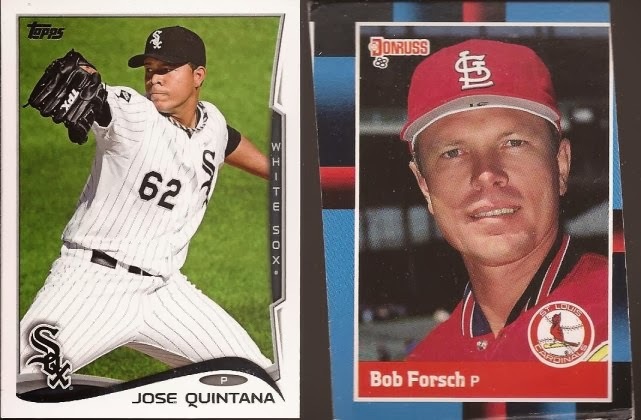 No - not the Quintana, but that gorgeous Forsch. Tom closed the letter "pure miscut gold", and I don't think truer words we typed. Just take in that beaut on the right. Angled. Cutoff image on the top right. Sliver of the adjoining card at the top left. The back? Oh yeah!! Words chopped off. Gold it is. It made me think about what I consider a great miscut card. What are the requirements to get a spot in a 9 card sleeve. I narrowed it down to 4 specs. 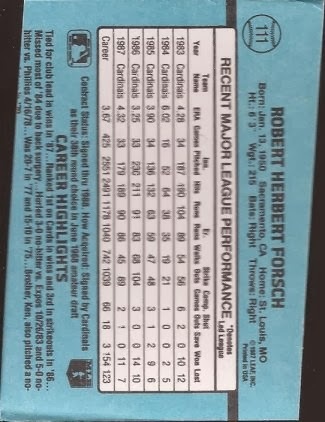 That Forsch has all four - the rarity. Let's pull out a few of my faves from my miscut binder. It's had to find more recent releases to add in the binder. So much has changed in the process, and the quality control is better. I believe I found both the Cox and the Downing in repacks. I must be the only person that would not get PO'd pulling a card that poor out of a repack. Someone sent me the Molinaro (Owl?) and I made a comment on that Fingers that Dime Box Nick pulled, and he was gracious enough to send it to me. Nick may have sent me that Palmer too - I don't remember. 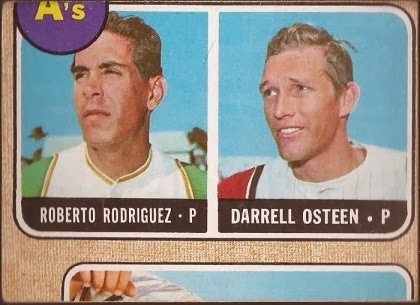 I know I found that Robinson at a card show for 33 cents. I think the miscut makes it an even better card. A rare horizontal miscut, though they should happen more often considering the print layout. Good ol' Greg from Plaschke sent that one to me. What is the oldest miscut in the binder? 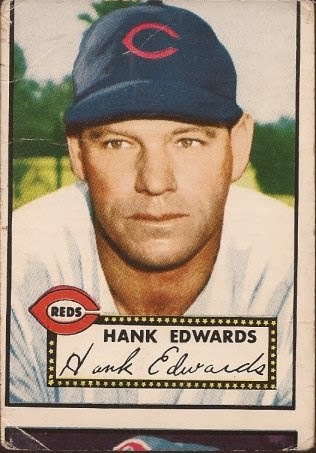 I paid five bucks for that gem of a miscut from '52 Topps. My LCS thought I was nuts. And while that is a great card, I have to give the current jewel of my miscut binder to this panel of three cards. I pulled these myself from a pack of Update. I know I commented about how most miscuts are from earlier years, and I think that is part of why these are great. How they got past QA is beyond me. But to get three cards, from the same printed page, into the same pack is fantastic. They all line up perfectly, as you can see. My miscut binder is 22 cards strong, but there is room for many more. Did you pull a bad card? Don't want to throw it out, and don't want to keep it either. Let 2x3 Heroes give it the love it deserves. 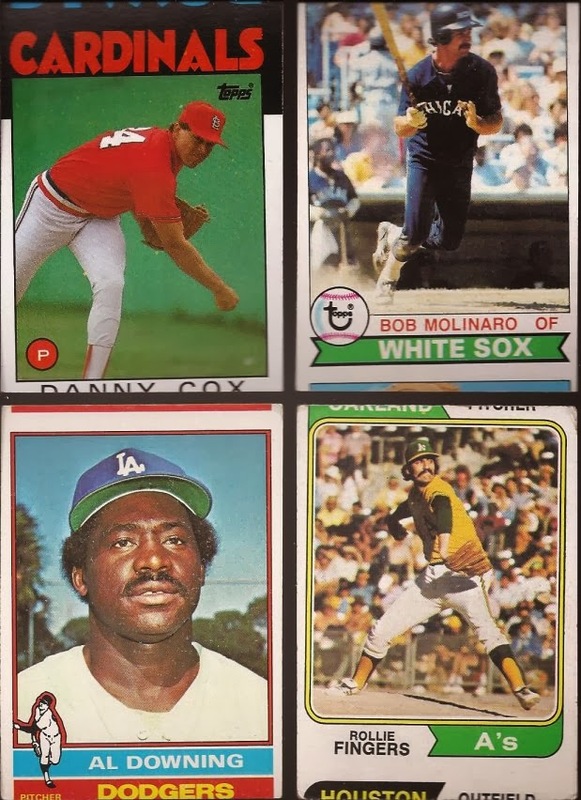 I have got some cool miscut cards (which I treasure dearly), but you have got some beauties. Wow! I love that panel of 2010s. That's awesome!